PORTLAND, Ore. -- Law enforcement officials in Oregon have issued a new missing poster of Kyron Horman, and are reminding the public that there is a $50,000 reward for information in the case of the boy who's been missing for nearly five years. On Thursday, the Multnomah County Sheriff's Office publicized the reward in the June 4, 2010 disappearance of the boy, who was seven at the time. He was reportedly dropped off at his Portland school for a science fair that day by his stepmother, Terri Horman. He was last seen around 8:45 a.m. as he walked down the hall to his classroom, but was reported absent from school, according to CBS affiliate KOIN. A photo taken of the boy that morning, smiling next to his science project, was widely distributed to the media. 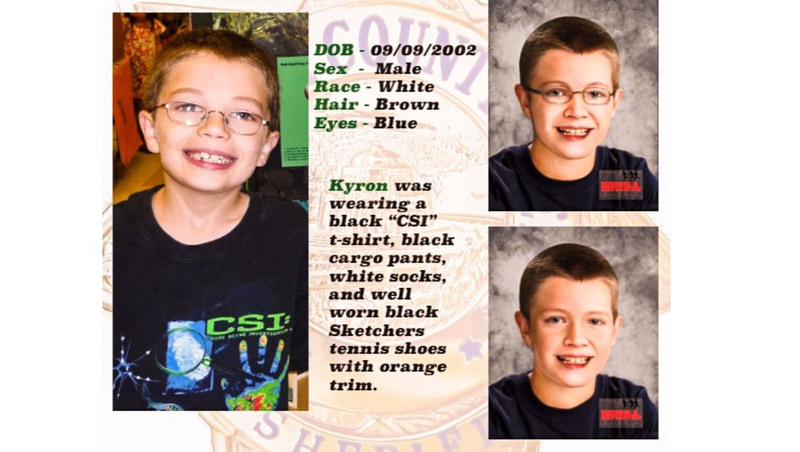 "The Multnomah County Sheriff's Office and our agency partners in this investigation remain committed to solving this crime, and bringing Kyron home," the agency said in a statement released Thursday. According to Oregon Live.com, the reward is not new -- officials increased it from $25,000 to $50,000 eight weeks after Kyron's disappearance. They reportedly released a new missing person's poster Thursday publicizing the reward for information that leads to the resolution of the boy's disappearance. The new poster includes age-progressed images of the child. After Kyron Horman vanished, investigators launched the state's largest search operation, calling in federal investigators and the Oregon National guard. More than 200 of the boy's schoolmates and their parents were interviewed by police, reports KOIN. The sheriff's office released a photograph with pictures of Terri Horman and her white Ford pickup several months after the boy's disappearance. However, no suspects have been named in the case and no one has been charged. A grand jury has received evidence in the case and is impaneled to hear testimony, according to the sheriff's office. A full-time detective remains primarily assigned to the case, and a retired FBI agent is also helping to review the evidence amassed by investigations, sheriff's officials say. More than 4,000 tips have been received in the case, officials say.